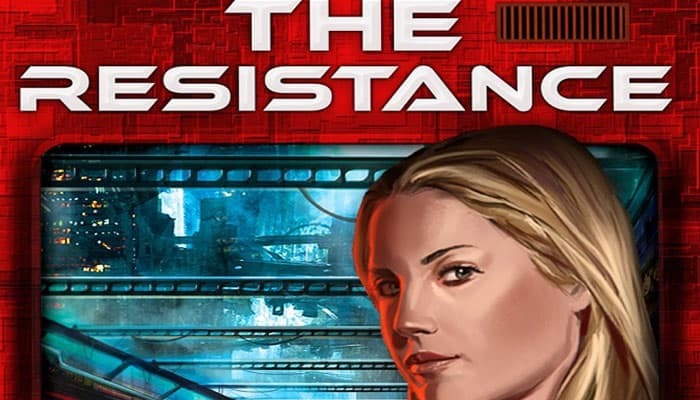 The Resistance is a social deduction game with secret identities. 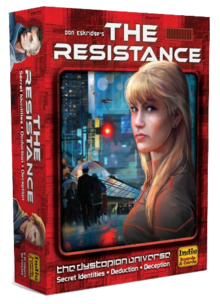 Players are either members of the resistance attempting to overthrow a malignant government, or spies trying to thwart the Resistance. 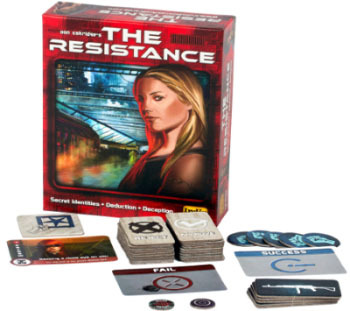 The Resistance wins the game if three Missions are completed successfully. The Spies win if three Missions fail. The Spies can also win if the Resistance is unable to organize the Mission Team at any point in the game (5 failed votes on a single mission). A fundamental rule of the game is that players may say anything that they want, at anytime during the game. You are allowed to say anything, to any one, at any time as long as it is said publicly. Discussion, deception, intuition, social interaction and logical deductions are all equally important to winning. Character Cards - Determine the player's affiliation (each player is either a resistance operative or a spy). A player's Character Card may not be revealed at any point in the game, nor the character art discussed. Leader Card - Designates the players that will form the Mission Team. Team Cards - Allocate positions on the Mission Team. Vote Cards - Approve or reject the Leader's Mission Team. Mission Cards - Determine Mission success or failure. Place the tableau in the center of the play area with the Score Markers, Team cards and Mission cards adjacent to the Tableau. Place the Round marker on the Tableau's 1st Mission space. Give each player a set of two Vote cards. Randomly select a Leader; the Leader receives the Leader card. Use the chart below to determine the number of Resistance Operatives and Spies that will be in the game. Shuffle the appropriate numbers of character cards. Deal one card to each player face down. Each player secretly looks at the role assigned to them on the character card. Spies open your eyes. Spies look around and make sure that you know all the other spies. Spies close your eyes. Everyone's eyes should be closed. The game consists of several Rounds; each Round is comprised of a Team building phase and a Mission phase. The team building phase consists of the Leader picking the players that he would like on the Mission Team followed by all the players voting to approve/reject the Mission Team. Mission Team Assignment: After appropriate discussion, the Leader takes the required number of team cards (using the chart below) and assigns each team card to any player including himself. Note a player may only be assigned one team card. Mission Team Vote: After appropriate discussion, the Leader calls for a vote on the team assignments. Each player, including the leader, secretly selects one vote card. When all players have their selected Vote card ready, the Leader asks for the votes to be revealed. The mission team is approved if the majority of Votes are affirmative and fails if a majority rejected the assignments; a tied vote is also a rejection. If the mission team is approved, play continues in the mission phase. If the mission team is rejected, the leader passes in a clockwise manner and the team building phase is repeated. The spies win the game if five mission teams are rejected in a single round (5 failed votes). Each player on the mission Team must secretly decide to either support or sabotage the Mission. The leader passes a set of Mission Cards to each mission team member. Each player on the mission selects a mission card and plays it face down in front of themselves. The leader collects and shuffles the played mission cards before revealing. The mission is successful only if all the cards revealed are mission success cards. The mission fails if one (or more) mission fail cards have been played. Note: The resistance operatives must select the mission success card; spies may select either the mission success or mission fail card. The 4th mission in games of 7 or more players requires at least two mission fail cards to be a failed mission. It's suggested that two different players shuffle the played and discarded mission cards before revealing. After the mission has been completed, advance the round marker to the next mission space on the tableau. Indicate a mission success with a blue marker or mission fail with a red marker in the mission space. The leader passes in a clockwise manner and the team building phase of the next round begins. The game ends immediately after either three successful or three failed missions. The Resistance wins if three missions are successful. The spies win if three missions fail. Notes: information in The Resistance comes at multiple levels. First are players' voting patterns, second are Mission results, and third are cues that you can discern from player interactions. Resistance Operatives must use all the information at hand to root out the spy infestation. It's not easy to overthrow a powerful government. You can expect the spies will win a significant proportion of the time with the core game rules, particularly when played with more than 7 players. The plot cards in the "The Plot Thickens" expansion (included) provide additional information for the Resistance Operatives, and opportunities for the Spies to be more deceitful.